Liquid sensors are used for measuring various parameters of liquids including water, petrol, diesel, edible oil etc. Few of the parameters are the level of the liquid in the tank, flow rate of the liquid, leakage detection of the liquid etc. Liquid sensors for water, fuel, Diesel tank etc. Liquid sensors are used to measure and monitor parameters related to liquids and include applications such as water leakage sensor, fuel sensor, water level sensor, diesel sensor etc. Water leakage sensor is commonly used for keeping a watch on water leakage and moisture accumulation in critical areas such as data centres, server room etc. Other major uses of water leakage sensors are detecting leakage of pipes, tanks etc. The sensor consists of a conductive wire or strips laid out in the area to be monitored. Typically stainless steel, copper etc. 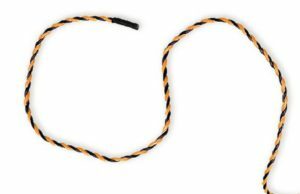 are used as sensor wires. The operating principle is that the resistance of the conductor varies upon detecting water. By measuring the current passing through the sensor, the water leakage can be detected. 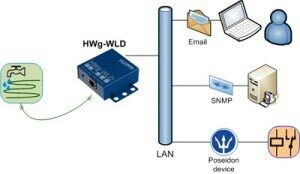 There are different models of sensors which can be connected to an IP-based remote monitoring system and can generate email, SMS or phone call alerts. The sensors also can work as a completely independent system without the need of a computer or server. Please see our separate page on Water leak detection alert system. 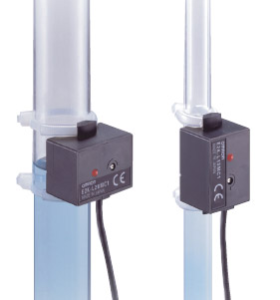 Various level sensors are used to detect the level of a liquid commonly inside a tank. 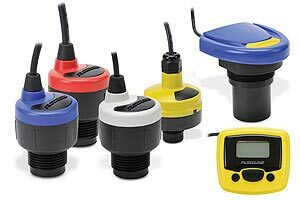 Water level sensor is one of the most common types of such sensors. Different liquid sensors are used to detect the level. One of the oldest types of water level detector is a float which is a simple level with an air-filled float at the end of it. Water level sensors of modern technology are a non-touch type, implying that the sensors will not touch water or the liquid. One such technology is ultrasound which consists of a transmitter and receiver mounted at the top of the tank. The transmitter generates ultrasonic waves towards the bottom of the tank. The sound waves get reflected the top of the liquid and bounces back to the receiver which is adjacent to the transmitter. The speed of the waves and time taken from the moment the ultrasonic wave is generated and the time it is received back at the receiver gives an easy calculation of the distance from the transmitter to the top of the liquid. The advantage is that this type can be used for very tall tanks and even for liquids which are corrosive in nature. All level sensor will have electrical outputs for displaying the readings and switching circuits will be provided for switching circuits. Fuel sensors are used to measure fuel level, fuel temperature, fuel quality sensor etc. Capacitive and resistive type sensors are used with explosion proof connection heads as required. Fuel sensors are used for fuel storage tanks, transportation tankers and also for the various type of engines including automotive engines for continuously monitoring different parameters of fuels and most of such sensors are classified explosion proof type of assembly. Application of these sensors for sewage tank is also similar to any other tanks. However, the sensors are capable of withstanding the adverse conditions inside the tank. The principal of operation is similar to other such sensors only. We can provide the following alerts or signals from sensors, depending on customer requirements. A phone call alert with a SIM card based system. The system can record a custom voice message. The system generates phone calls to 10 people. When the operator attends the phone, he will hear the recorded voice message. As an option, we supply a battery back up also so that it will generate alerts even in case of a power failure. The above system can also make SMS messages to 1o operators. The user can customize the message to display location, type of alert etc. A local siren or buzzer to generate a local alert. A volt free signal for connecting to a BMS system, SCADA, IOT etc. 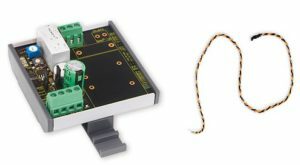 We also supply any of these sensors suitable for connection to an Internet of Things (IOT) Platform for remote monitoring.